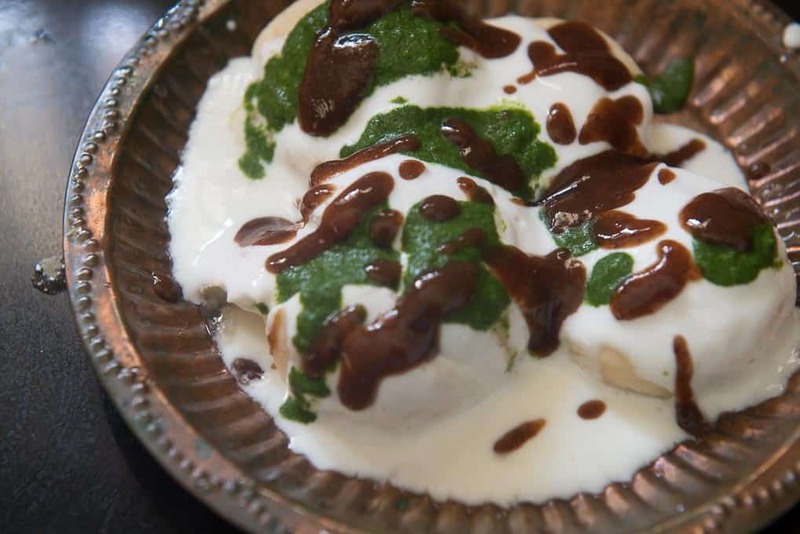 Dahi Vada or Dahi Bara are fried lentil dumplings, topped with curd, variety of chutney and spices. It’s a famous Indian Chaat recipes and a very popular street food. Learn to make super soft Punjabi Dahi Bade at home using this Step By Step Recipe. Here is how to make Dahi Bada Recipe. Gone are the days when blogging was only about your passion and sharing the things you loved. In today’s time, if you want your blog to be your profession, you will have to take it as a serious business and will have to dedicate as much time and effort that you would have to set up any other business. But the good thing about blogging is that you can still follow your passion and I guess it’s easier to work hard when your work is what you love to do. Since it’s your passion, it doesn’t feel like work anymore. This year I planned to be more organised and made my 3 months calendar already. This helped me look things in a different perspective, decide what to share when and be more smart in sharing the content. 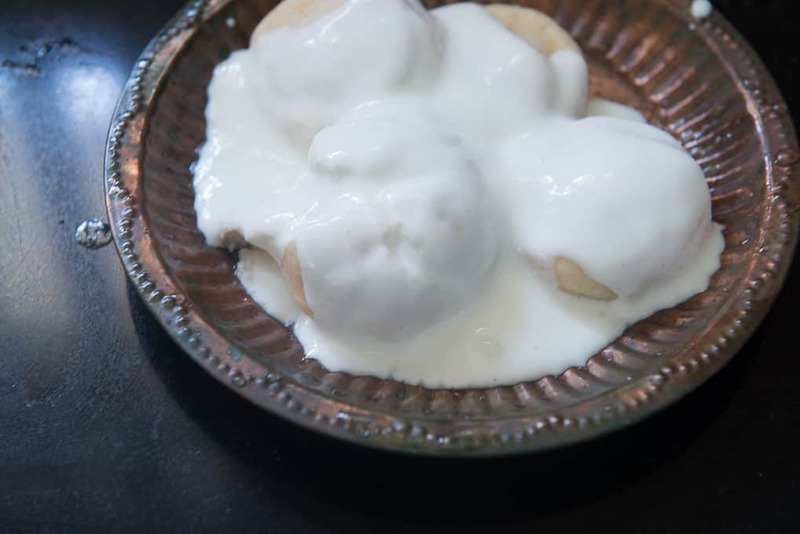 The first recipe I am sharing in this HOLI Series is this delicious Dahi Vada. 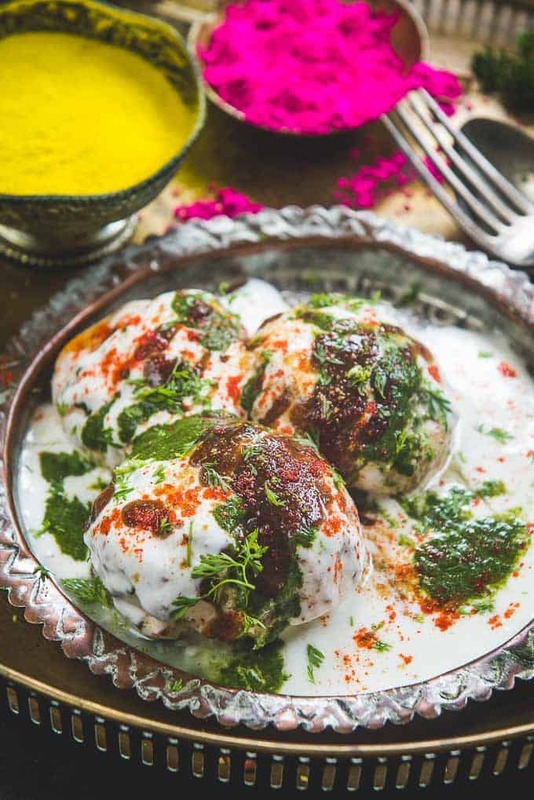 Dahi Vada or Dahi Bara are fried lentil dumplings, topped with curd, variety of chutney and spices. It’s a famous Indian Chaat recipes and a very popular street food. These soft as cloud Dahi Vada and that chilled creamy curd on top, this description itself is good enough to make me drool. Don’t you think? I like to top my Dahi Vada with green Coriander Mint Green Chutney, Tamarind Chutney, Dahi Vada Masala, Roasted cumin powder and red chilli powder. You can skip the chutney and just sprinkle some spices on top. Just experiment with the topping and see which fits your taste the best. Some people makes the Dahi Vada using only Urad dal but some use a mix of Urad and Moong dal. The vada with moong da is lighter for the stomach. Also there are some difference in how the vada are made in North Indian and South India. I will explain it below. So do read it. To make soft dahi vada recipe with soft centre, the trick is to whip the lentil paste until it is very light and fluffy. 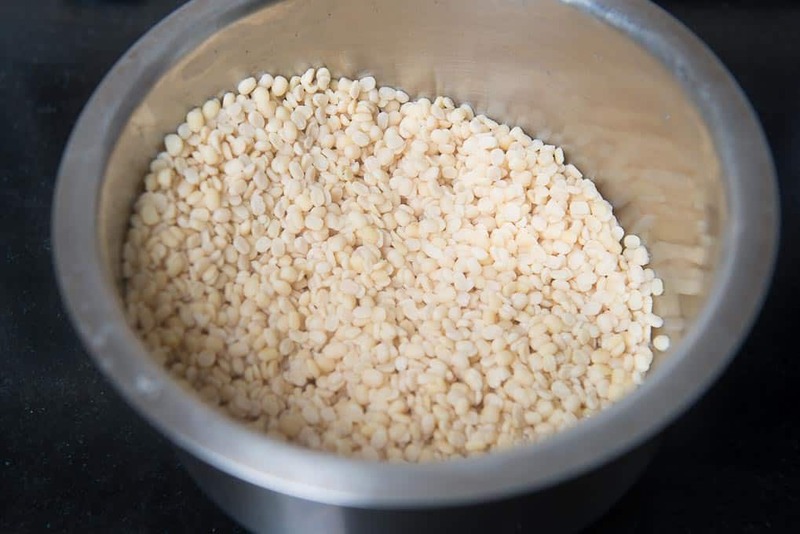 After grinding the lentils to a fine paste in a grinder, whisk it using your hands for 2-3 minutes. Add a little baking soda while whisking it. Then take a bowl filled with water and drop a small ball of the batter in it. 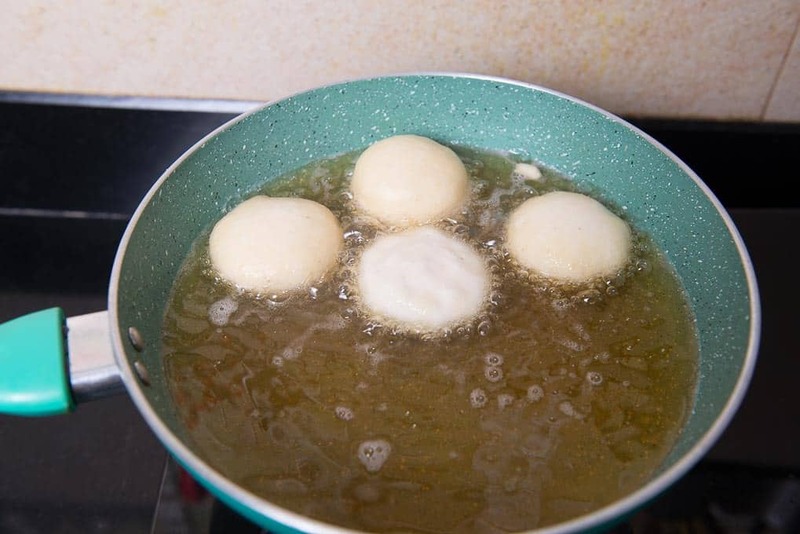 If the drop immediately starts to float on top, the batter is ready to fry. While frying the dahi bada, fry them on medium heat and as soon as you drop them in oil, keep pouring oil over them using a ladle to seal the air inside. Double frying the vada also makes them crunchy from outside and soft from inside. To make fabulous dahi bara, soak them in lukewarm water. Soaking in water makes the dahi vada super soft and aids in soaking up some of the flavours from the curd. 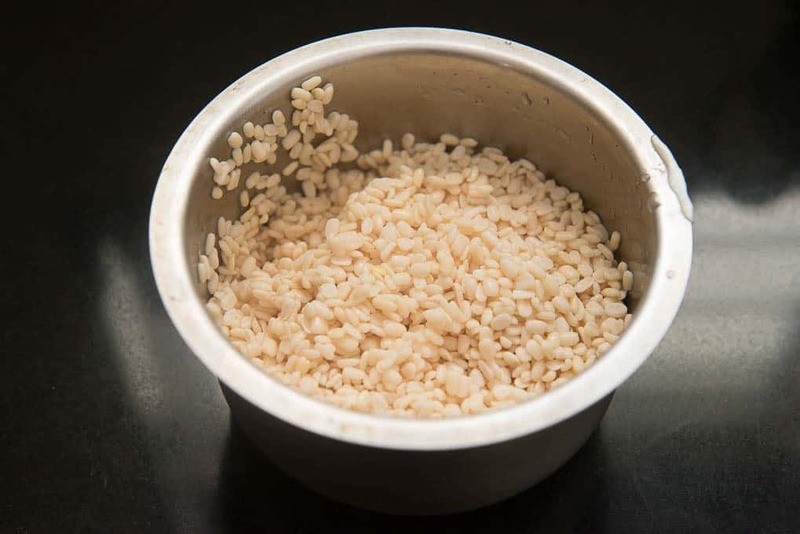 Just press them lightly to remove excess water before putting them in the serving plate and topping with curd. You can also add moong dal in the dahi vada but I prefer to use only Urad dal to make this lovely street food. So let’s waste no time and see how to make these beauties at home. 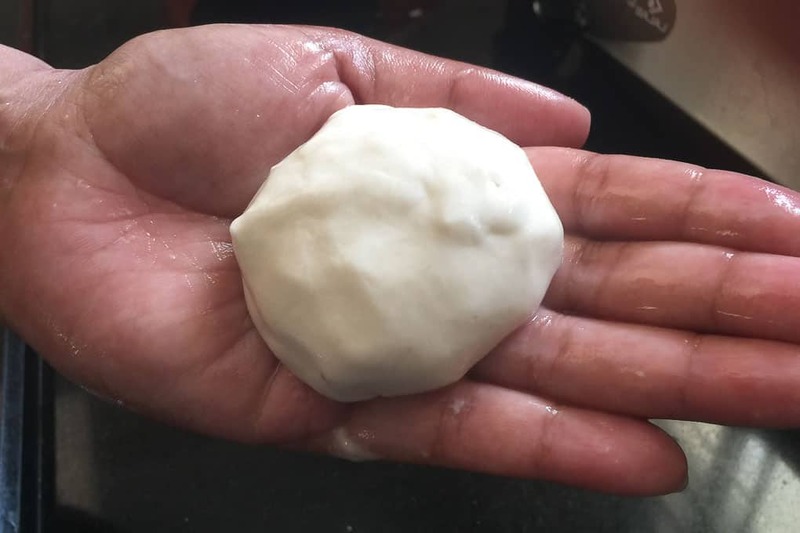 Here is how to make Dahi Vada. 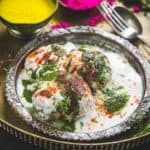 How to make Dahi Vada Masala? Dry roast 1 tbsp Coriander Seeds, 1 tbsp Cumin Seeds, 8-10 Dry Red Chillies, 1 tsp Black Peppercorns, 2 inch Cinnamon and 2-3 Black cardamom until slightly browned and fragrant. Cool and grind to make smooth powder. Sprinkle a little bit of Dahi Vada Masala over your Dahi Vada and store the remaining in an airtight container. How to make South Indian Style Dahi Vada? 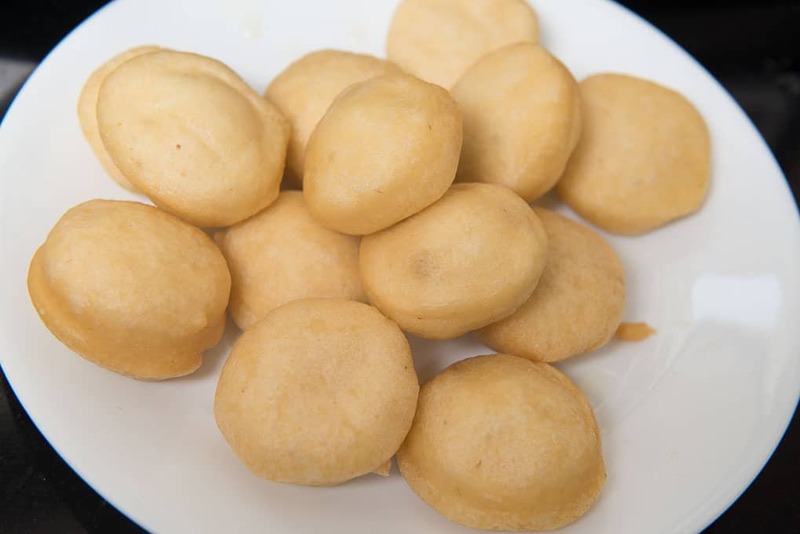 To make South Indian style Dahi vada, make the batter for the vada in the same manner as mentioned below. While shaping the vada, just make a hole in the centre of the vada and then fry as mentioned. Soak the fried vadas in hot milk. 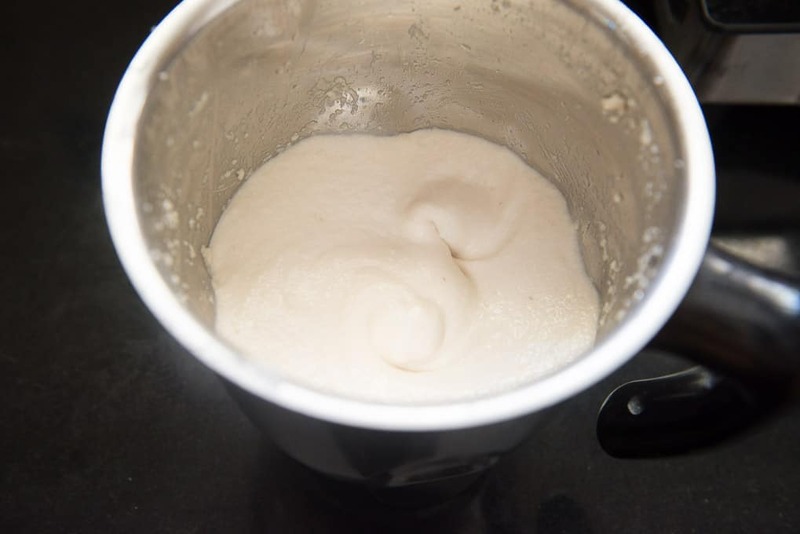 For the curd mixture, whisk the curd until smooth. Add ginger and green chilli paste, chopped coriander, salt and sugar and whisk well. Take out the vada in serving plate and top with curd mixture. 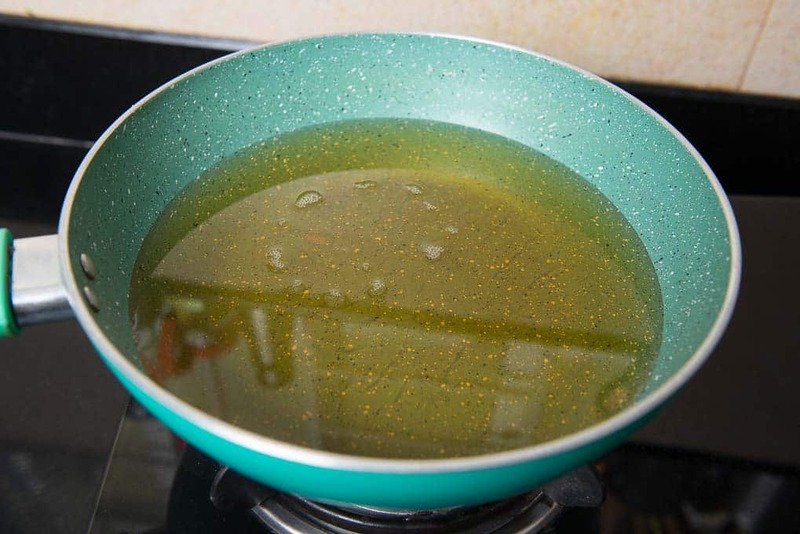 Make a tempering of vegetable oil, curry leaves, urad dal and hing and pour it over the vadas. 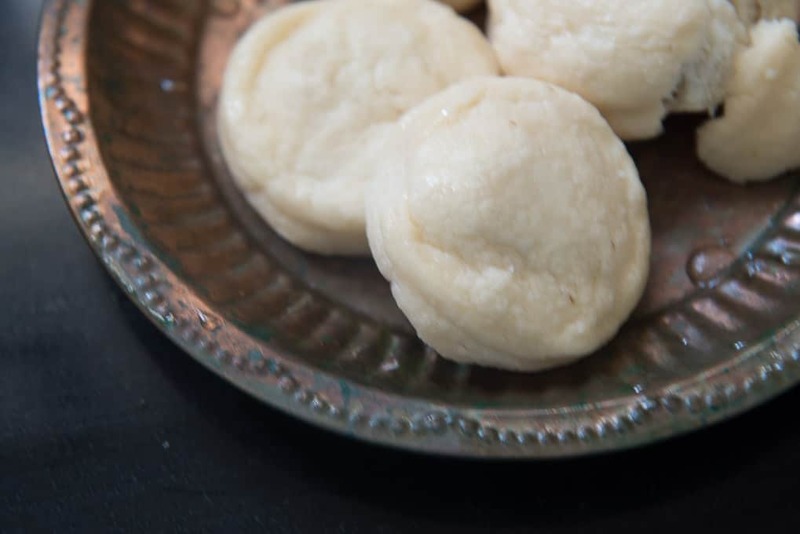 How to make Bread Dahi Vada? I have a fabulous recipe to make dahi Bade using bread slices. They taste just like the dal ones but are much easier to make. Click here to get the recipe of Bread ke Dahi Vade. How to make Dahi Vada using Moong dal? Wash the dal and soak in 3-4 cups of water for 4-5 hours. Drain the water and add the dal in a blender along with ginger, green chilli and salt. Blend the dal to make a thick paste. Add just add 2-3 tsp of water while grinding the dal. Use your hands and whisk the dal for 4-5 minutes until it is very light. Cover the bowl and keep aside for 15 minutes. Add the baking soda and whisk for another minute. Take a bowl filled with water and drop small drop of batter in it. 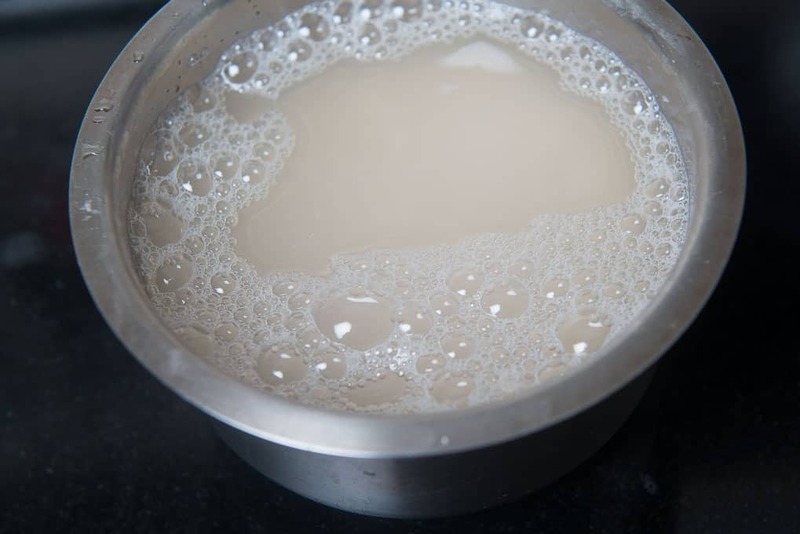 If the batter immediately starts to float on top of the water, the batter is ready. If not, then whisk it some more. Wet your hands with water and take out small portion of the batter in your palms. Shape it into a flat round vada. Drop the vada in hot oil. Simmer the heat to medium low and fry all the vadas until they are slightly browned. Drain on a plate. Heat the oil to medium high and fry all the vadas again until they are golden brown from outside. Add the fried vada in soaking water and let them soak for 15 minutes. Press the vada lightly between your palm and arrange them in the serving plate. Top with coriander mint chutney and tamarind chutney. Sprinkle dahi vada masala, red chilli powder, roasted cumin powder, salt and fresh coriander. Chill for a few hours in refrigerator. Serve chilled. 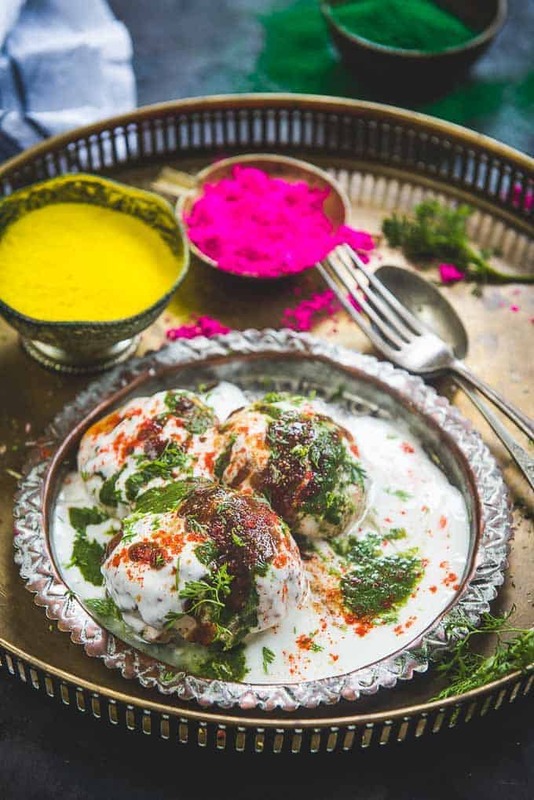 Dahi Vada or Dahi Bhalle are fried lentil dumplings, topped with curd, variety of chutney and spices. It's a famous Indian Chaat recipes and a very popular street food. Blend the dal to make a thick paste. Just add 2-3 tsp of water while grinding the dal. Use your hands and whisk the dal for 4-5 minutes until it is very light. Cover the bowl and keep aside for 15 minutes. Add the baking soda and whisk for another minute. 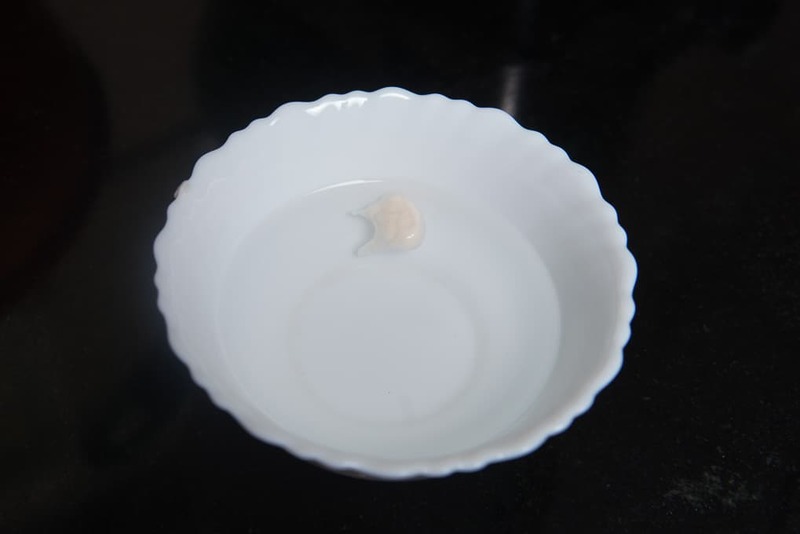 Take a bowl filled with water and drop small drop of batter in it. If the batter immediately starts to float on top of the water, the batter is ready. If not, then whisk it some more. Heat the oil once again and when it reaches medium high temperature, add all the vadas in the hot oil and double fry until nicely browned. Mix all the ingredients in a bowl and keep aside. Add the fried vada in soaking water and let them soak for 15 minutes. Press the vada between your palm lightly and arrange them in the serving plate. Top with coriander mint chutney and tamarind chutney. Sprinkle dahi vada masala, red chilli powder, roasted cumin powder, salt and fresh coriander. Chill for a few hours in refrigerator. You can stuff the dahi vada with a mixture of cashew nuts, coconut, raisins and ginger. 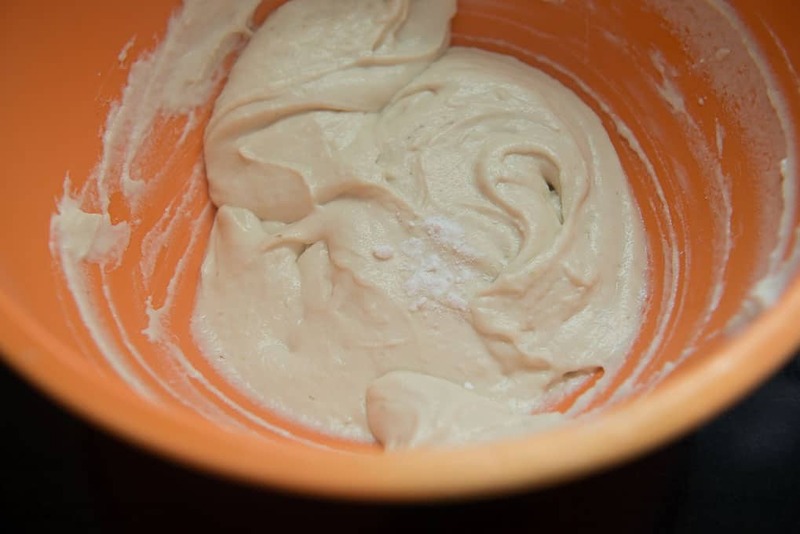 Just chop these ingredients and keep a little in the centre of the batter and cover it up with more batter. 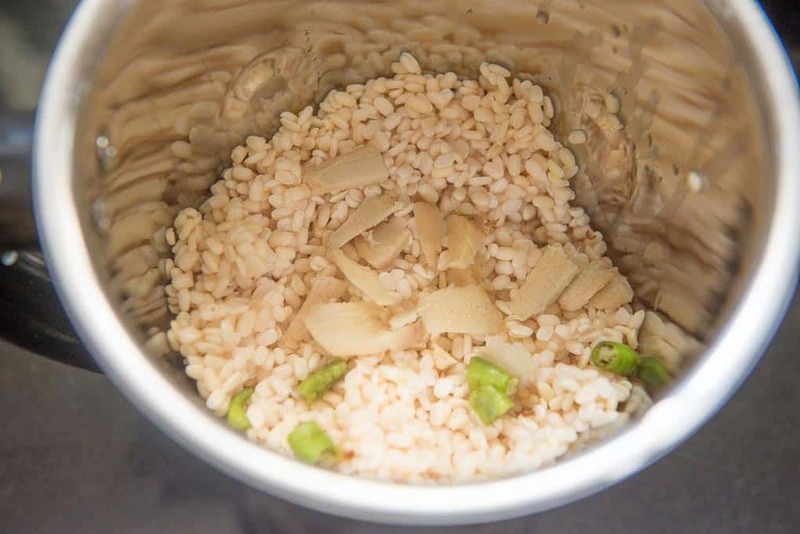 Do not add more water while grinding the dal. It will become difficult to shape it into vadas. Fry the vadas on medium low heat otherwise they will not cook in the centre. If you want to use the vadas later, just keep them in refrigerator for 2-3 days. Before using, dip them in soaking water for 20-25 minutes and then top with curd. Assemble the dahi vada 2-3 hours before serving. It allows the flavours to soak in the vadas. Just top with more chutney and spices at the time of serving and you are good to go.